A very trustworthy landowner called the office while cutting beans to inform us a buck of a lifetime was spotted bedding in a ditch running through section 20 in Daviess Co, Missouri Unit C. He said his son seen a buck on the same farm that was a 160 class antler. We personally passed this info to several hunters, but it was only a couple days before the firearms season and it slipped through the cracks, most likely due to a lack of timber. From a Missouri deer hunting lease stand point these aerials would be a pass for lack of aerial visible protective cover. 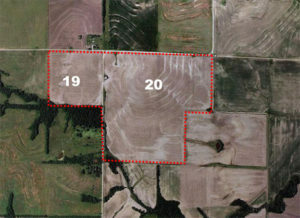 Section 19; this 40 acre farm adjoins section 20. The south and west side of the farm border some good timber and pasture. This farm is the primary food source for the bordering timber and pasture. Both of these farms have not been hunted for the past 5 plus seasons. They are in a remote area with very little human activity other than farming. Typically, we would not renew a lease that has not been hunted for 5 years, but this is part of a large lease package in both Missouri and Iowa. 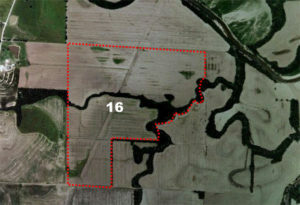 Section 16 consists of 256 acres. It was originally a 356 acre tract, but 110 acres sold several years ago. We had the farm broken into 3 sub-sections and kept it that way after the sale of the 110 acres. Over the past two years, this farm was not firearms deer hunted. We assume either tough mud road access or the sub-sections detoured members to go elsewhere. We can’t do anything about the access, but we eliminated the sub-sections hoping to enhance firearms usage of this property since it’s in prime whitetail country. FYI: In 1997 we attended the Missouri Show-Me Big Bucks Convention in Columbia Missouri. We met a young man that harvested a whopper 235 inch non-typical (remains 7th largest on record). He was familiar with some of our land and told us he harvested the deer in the Old Pattonsburg river bottoms. He and a couple of buddies jumped the deer out of a slough running through an open crop field. Another spot, section 34 is 1 mile north of 16 and it’s 275 acres of similar habitat in the same river bottoms that hasn’t seen a deer hunter in several years. In short, don’t overlook open crop fields with tree lines and ditches that adjoin timber, CRP and heavy brush. The majority of these farms were leased primarily for upland bird hunting but have hidden pockets of thin cover that are extremely attractive to mature bucks.